I usually buy downey,but I started buying snuggles love the smell it last longer,and the price is great. I'll never forget walking into my sisters home the first time after she started using Snuggle Blue Sparkle 3X fabric softner, her whole house had a fresh pleasant smell to it. When she told me what she used I went out right away and purchased this fabric softner for my laundry. I've used a number of softners, alot of them have a great scent but as soon as I dry my clothes in the dryer I'm left wondering where the fresh scent went. Not with this fabric softner, the scent stays for days, and freshens my closets, my whole house if I'm washing linens. I'm often surprised by how strong the scent is after washing clothes, it's a strong but pleasant smell that stays for days.The directions are simple, I tend to add a little extra even though I don't need to. I've used so many watered down fabric softners but Snuggles Blue Sparkle liquid pours a thick creamy liquid that's far from being watered down. I love this scent so much I've even used it as a fabric freshner. I add this to a spray bottle half water half fabric softner and spray throughout my house, I'm amazed at how fresh everything smells! Overall this has to be one of my favorite softners, because of the long lasting scent. I absolutely love the smell of the Snuggle Blue Sparkle 3X Concentrate Liquid Fabric Softener. The Blue Sparkle leaves my laundry smelling so fresh and clean. It does a wonderful job of not just hiding or masking the smell of my laundry but actually making them smell totally fresh. I love doing a fresh load of laundry and then using this fabric softener on my towels as it lasts for an extended period of time. Not only does this leave my laundry smelling great, but it also makes my laundry very soft and almost fluffy to the touch. It helps to bring out the softness in the fibers on my clothing giving it renewed life. This is one of the few fabric softeners that I have used that doesn't affect my sensitive skin and so this is great for those like me with sensitive skin issues. I do go through a bottle rather quickly, but that is because I like the smell so much that I use more than is required. I guess I like the smell so much that I have become quite addicted to it and won't wear any clothes unless they have been washed with Snuggle Blue Sparkle fabric softener. 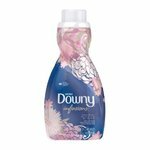 As a nice added bonus this fabric softener is often on sale making for it a great value. The bottle itself has its pros and cons. I like the cute factor of the paw prints and Snuggle the bear included on the bottle. However, on the downside, I do not like the fact that the instructions printed on the back of the bottle are all but impossible to read. The instructions are printed directly onto the bottle itself and in a font that is both tiny and blurry. My one wish is that Snuggle would change this. While I don't necessary require directions on how to use this fabric softener, it would at least be nice to have the option of using them if so I saw fit. The Snuggle line of fabric softener is very appropriately named. After doing my laundry with Sunggle fabric softener that is all I want to do in it. I love the way it makes my bedding smell and how soft it makes the fabric feel against my skin when wrapping up at night. 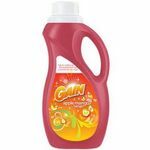 This softener leaves clothes with a great but not overpowering smell of clean that seems to last for weeks. 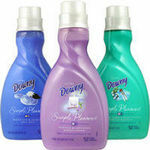 It is not as pricey as some other softeners such as Downy but does just a good a job, if not better. It can be used in both front and top loading machines and is safe to use with any type of fabric. I use a cap full for each load I do. I have not had any issues as far as skin irritations or rashes as I have had in the past with other products. My dog is also a huge fan. I always make sure to use this when washing his bed cover and he can't resist curling up in when I out it back on for him clean and fresh. It gets that "dog" smell out. This is by far the best fabric softner made! This fabric softener is amazing, and because it is 3x concentrate it lasts forever! 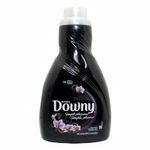 This fabric softener leaves clothes smelling so fresh and wonderful and the clean smell lasts through several wears. So if you have a limited wardrobe and you are careful, your clothes still smell great and are super soft for a second or even third wear before you have to wash them again. Also, the product is easy on the skin, so if you have allergies, it won't bother your sensitive skin or nose. This is an exceptional product! Performance Snuggle blue sparkle outperforms all other fabric softeners I have ever used. Once you try it you will never go back to any other type. Definitely the best ever. Scent The scent of this product is amazing, and it lasts and lasts. I like that it is not too "girlie", it is just fresh, so my husband does not feel like a walking flower. He smells nice and clean, has super, duper soft clothes, and doesn't smell like a girl. This product has a great scent for a great product! I have used Snuggle for a long time and it is a my favorite softener to use. It makes my clothes smell great and feel soft. The only draw back is that it does not stay the same consistency for a long time (which is why I don't stock up) it becomes extremely thick and hard to use (the fact that it is 3x means you don't use as much). Even diluting it does not work. I never have this issue with liquid detergent. But overall Snuggle is among the best. Performance Makes clothes feel soft and smells great. Scent The scent of Snuggle smells really nice. It has a very pleasant floral scent. I love the classic laundry smells. They take me back to my childhood when I would build a fort out of my Grandmother's freshly washed towels. I like Snuggle Blue Sparkle because of it is simple fresh scent. It is hard to argue that Blue Sparkle smells upliftingly wonderful. I am sure there are those are disagree, but to each nose their own! I would definitly recommend this stuff if you love that simple clean smell. Some of you might think it's weird but if Snuggle came out with a line of bath and body products using natural ingredients that smelled just like their fabric softeners, I would be all over that in a minute! It would be neat if they would make an entire line of personal care products like shower gel, lotion, body spray or even body wipes to freshen up after a workout... However, it is just a thought, I have no idea if it would work but if it did that would be pretty cool! I'm always looking for new things like this. Performance It does the job as far as making laundry soft and static free. It makes doing the lundry simple and easy. I like it because it's not too thick or thin. Scent The smell of Snuggle Blue Sparkle makes me smile. Fabric softeners do make a difference and while fabric softener sheets are still the hands- down winner for convenience, liquid fabric softeners often get the nod for making clothing soft. 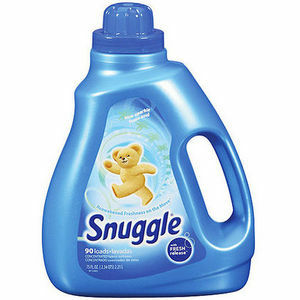 A popular name in the liquid fabric softener market is Snuggle. Its **Snuggle Ultra Blue Sparkle Fabric Softener** is one of the best for adding softness and fresh fragrance. Let's take a look: **Fabric Softener Commentary:** Snuggle Ultra Blue Sparkle Fabric Softener is a fresh, fragrant product with excellent softening ability. It needs to be added to laundry during the final rinse, or added to a fabric softening dispenser. It softens clothing and adds a fresh fragrance that most anyone will love and it is good for high efficiency or regular washing machines. Snuggle Ultra Blue Sparkle Fabric Softener adds a great deal of softness to clothing and you can certainly feel the difference in your laundry. The added softness is good for those who have skin irritation problems caused by using harsh detergent. But even if you don't experience this type of problem, the added softness is still a nice touch. Snuggle Ultra Blue Sparkle Fabric Softener is a great for its fresh fragrance, but this is one fact that some may not prefer. It depends on your preference for scent. 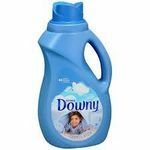 If you like the scent you get from your laundry detergent, then you will not want to use this fabric softener because it will erase the scent from the detergent and replace it with the scent of Snuggle. For the rest of us, Snuggle is a good option because, in most instances, it offers a scent that is better than that of detergent. **Bottom- Line Viewpoint:** Snuggle Ultra Blue Sparkle Fabric Softener is a great product to add to your clothing. It should never be added directly to clothing surfaces because doing so can cause spots. Just add to the final rinse and let Snuggle do the rest. It cleans and softens all types of clothing and works in any type of machine. I have always wanted to try Snuggle's **Blue Sparkle** liquid fabric softener, having already used the dryer sheets and coming away quite impressed with them. So, I picked up a bottle of this stuff and went home eagerly to try it out. The fragrance is a real winner for me - in the bottle, it has this soothing warmth to it, like a basket of linens fresh from the dryer, right when they are nice, warm, and fluffy. But the true heart of the fragrance is revealed when the liquid hits the water - then it blossoms into this cosy, dream-like fragrance that reminds me of childhood - warm blankets that you cuddle up under watching the stars, marveling at the pearly face of the moon. The scent is a bit more 'masculine' in that the predominant notes are very subtle and calm, not sugary-sweet or powder-puff like. Crisp, dark greens like French cassis blend with subtle woods to create this aroma of richness, while a hint of powdery violet and orris root lend this dreamy lushness that is at once romantic and soothing, giving it the same air as fresh baby powder. It's the perfect scent for those that like more of a powdered note than a sweet, sugared one. Plus, a little bite of Snuggle goes a very, very long way into making a pile of stiff, stale laundry into a delicious, warm, and snuggly load of freshness. Everything from towels, sheets, cotton, and what not is suddenly and instantly transformed from stiff to silky, without all the hassle or need to add extra softener. A small amount of Snuggle really changes every single load of laundry, and when my clothes have finished drying, they just simply float onto skin and hug every single curve of your body with warmth and care. The scent of the softener coats the fabric with a delicate aroma of freshness, neither too overpowering nor faint you can't smell it five seconds after clothes have set and cooled. I have fewer wrinkles, barely any static cling, and my clothes stay soft and smell amazing, even after a few days. Snuggle is also way more affordable than many other brands, and lasts many days longer than its competitors. I highly suggest the **Blue Sparkle** scent if you are looking for something that is youthful, but also pleasing and more along the lines of 'unisex', especially if you live with picky people. I love all scents, but this is a real refreshing change from many of the run-of-the-mill softeners, and everytime I smell it, I'm instantly transported to a childhood world of dreams, where the moon kisses the sun, and the stars sing until dawn. I have tried so many fabric softeners out there and my favorite one is the Snuggle Blue Sparkle 3x Concentrate fabric softenter. The softener works great in softening my clothes. I also love this scent. It is wonderful and so refreshing. It is also great because the scent lasts for days. I can have some towels in the linen closet for a couple of weeks and then take them out and they smell like the day that I put them away. I love that the scent does not fade through time. I also love the fact that it is very concentrated because it does not take up too much room in my laundry. The only negative that I would have about it is that if you get the economy size one it does get a bit messy if you use thei measuring cup.